When you're doing academic research, you'll probably encounter a lot of journal articles. 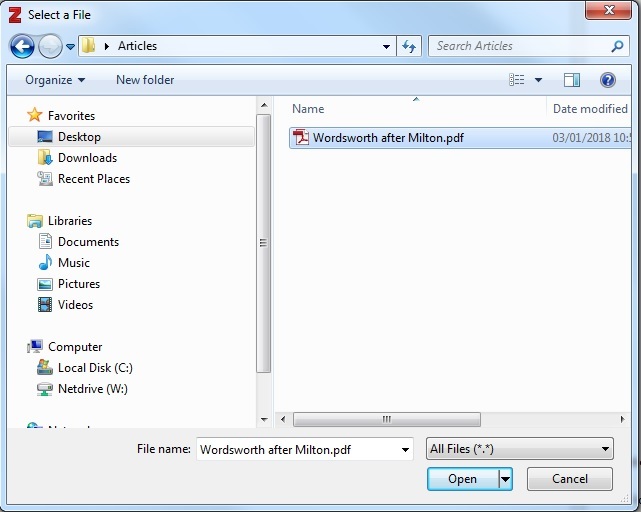 To keep track of which articles you've looked at and where, it's a good idea to save them. That way, you can easily find them in the future when you want to cite them in your paper. With one click, Zotero and Zotero Connector let you easily save journal article(s) from your browser to your library. This will help you stay organized, keep track of your references and citations, and can prevent you from losing or misplacing an article! 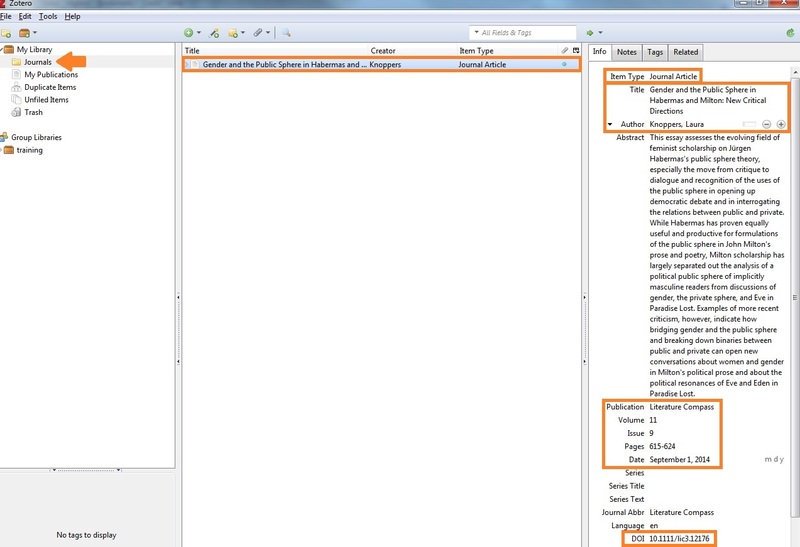 We'll take a look at how to capture single articles, then how to capture multiple articles. 1. 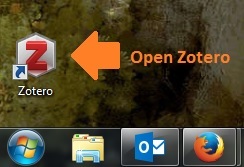 Start by opening Zotero in your computer. Note: Zotero must be open in order to add items to your library. 2. Next, it's time to find some articles. 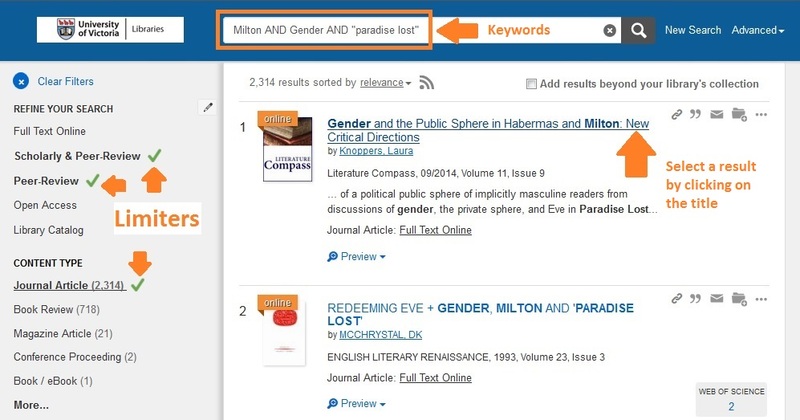 From the library homepage, search your topic keywords to find a journal article. Click the title of an article you would like to save. 2. Once you've selected the journal article and are viewing it in your browser, you'll see an icon that looks like a tiny sheet of paper in the top right hand corner of your browser window; if you hover over it, it says "Save to Zotero". Click that sheet of paper. Once you've clicked the sheet of paper, you'll see a small pop-up in the bottom right of the screen that says "Saving to [Folder]". Where it saves in your Zotero depends on if you've created a collection and selected it. Don't panic if you haven't created a collection yet! Items can be moved between collections within your library. 4. Now if you go to Zotero, the journal article you saved is in your library. Depending on the journal article you chose, Zotero will have recorded the name of the article, the author, the abstract, the date, the journal name, the volume and issue number, the DOI. Zotero also tells you what type of item it is, to further organize your collection. 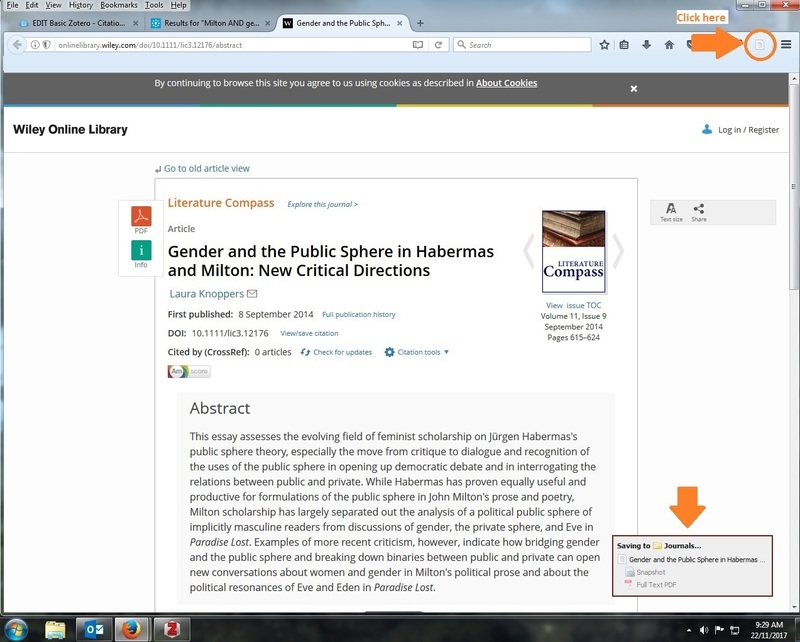 You have now added a journal article to Zotero! From here, you can add tags and notes, move the article to a different collection, export the article to Word for your bibliography, and more. Zotero also lets you capture multiple journal article in one click. 1. Let's go back to our search results, where we had the list of articles related to our keywords. Notice that in the corner (where the sheet of paper would be for the individual article) there is a small folder. Click that folder icon. 2. 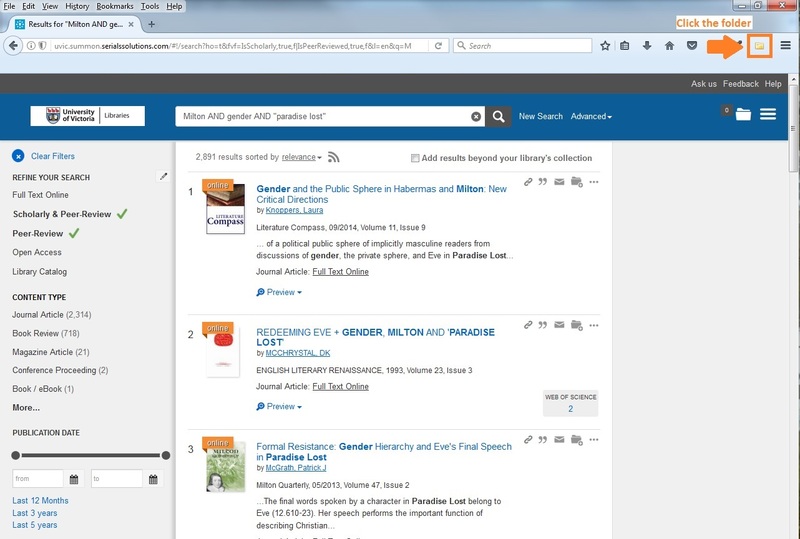 When you click the folder, a pop-up will appear with the titles of the journal articles from the search results. They have checkboxes next to the article name. Click the boxes of the journal articles you want to save, then click "OK". Note: The number of articles that appear will be limited to the ones you have scrolled over/that are visible on the page. You will need to scroll down before checking the folder, to save the articles that are further down the list. 3. Once you have hit "OK" you will see the journals being saved to your collection, in the bottom right corner of your browser screen. 4. Now, looking at the collection in Zotero, you can see that all the journal articles selected are now saved to the library! 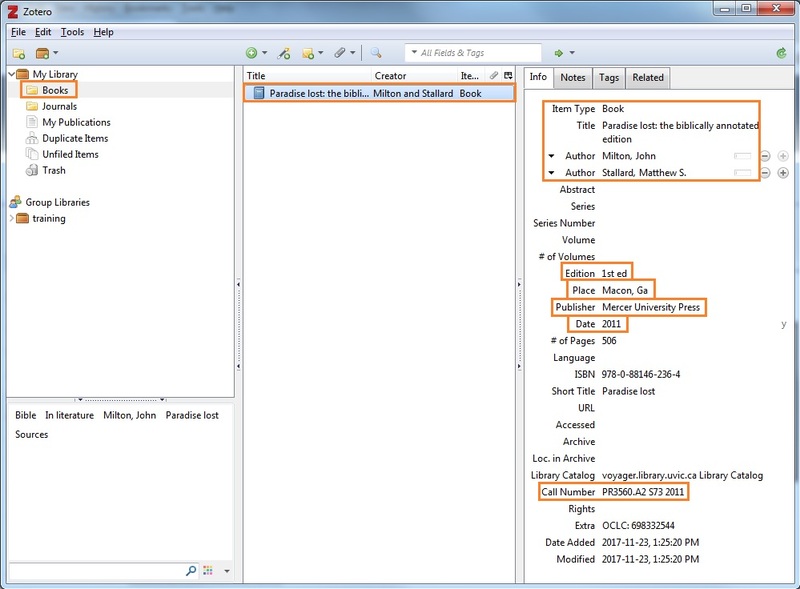 Note: This is a fast way to select multiple items, but ensure that Zotero has collected all the pertinent information. Sometimes it will skip important areas you need for your bibliography, like the doi/URL, or the complete author name. By making sure the saved item is complete now, you will save yourself time later when you want to cite that resource. You have now added multiple articles to Zotero! From here you can add tags and notes, move the articles to a different collection or organize them, export the articles to Word for your bibliography, and more. Use Zotero Connector to capture a book from a library catalog. 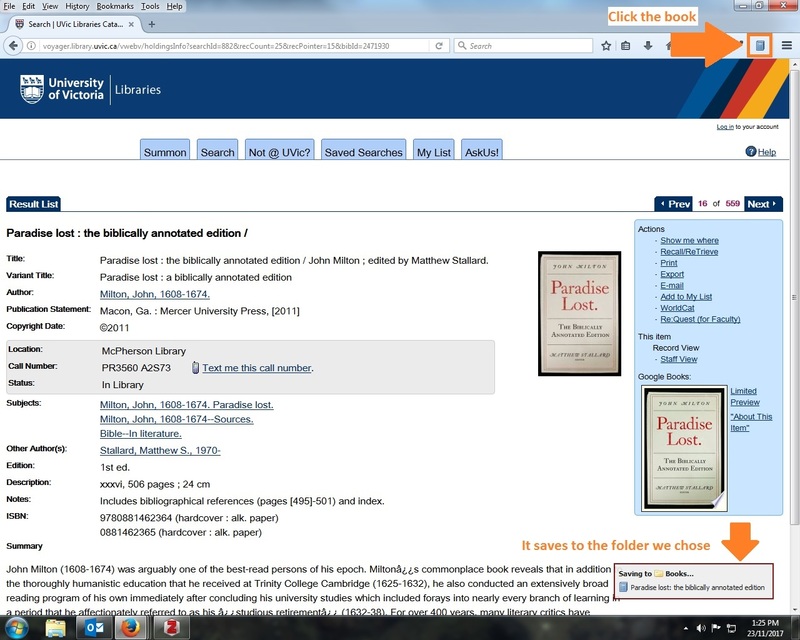 Use an identifier like an ISBN to populate a record in your library. Enter the book information into Zotero manually. This requires more effort, as it involves inputting the title, author name, date, publisher info, and so on. We'll examine all these options below. 1. 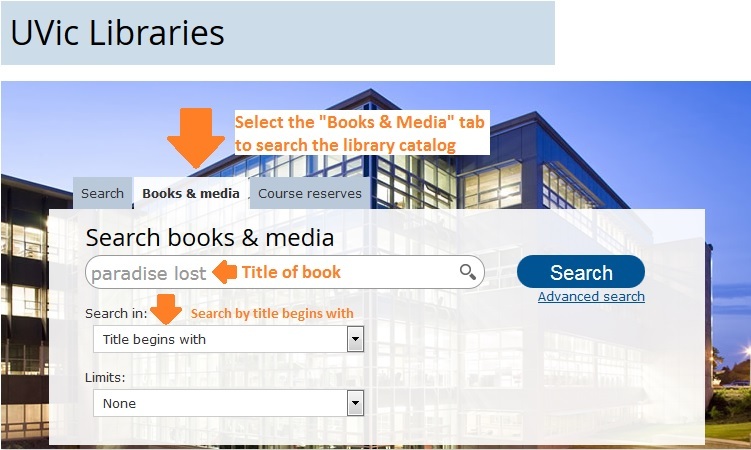 Look up the book you wish to save in the UVic Library Catalog. Once you have found it, click the title so you can see all the information about the item. 2. Once you're in the book's catalog record, you'll notice in the top right corner there is a small book icon. Click that icon to save the book to Zotero. 3. Now if you go to Zotero you'll see the book you saved from the library catalog. Check that all the necessary information has been saved, and that it is correct. This could include the title, the author, the date published, the edition, the place of publication and publishing house, as well as the call number for UVic, in case you need to find the item in the stacks. 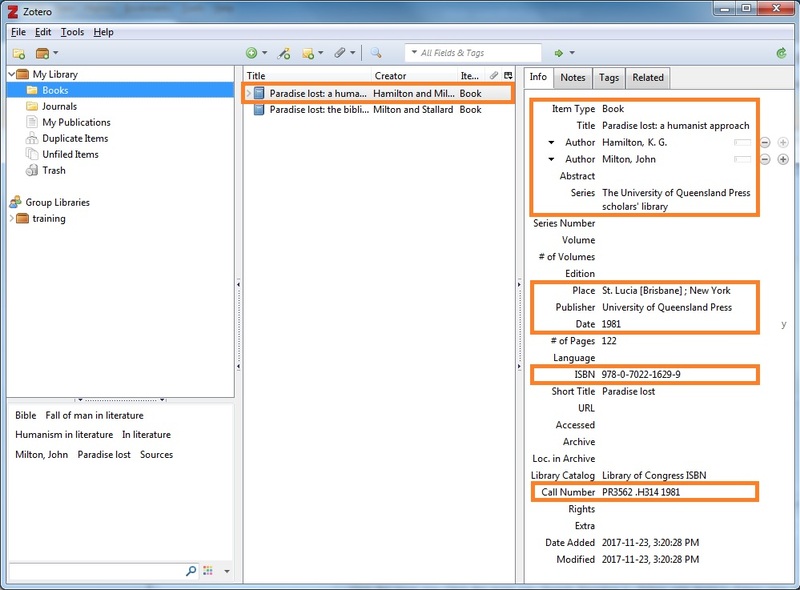 If you go to Zotero, you will find that you can also add books from inside the software. This is a great option if you have a stack of books you got out from the library and you just quickly want to add them in. You'll need to identify the ISBN to perform this task. 2. At the top of the window in the toolbar, you'll see a little magic wand with a green plus symbol. If you hover over it, you'll see it says "Add Item(s) by Identifier". From here you can input the ISBN number of the book you want to add to your library. The ISBN of a book is usually located in the first few pages at the front, usually on the back side of the title page. It will be either a 10 digit or 13 digit number. You do not need to insert the spaces, just the numbers. If you do not see it in the front part of the book, check the barcode on the back of the book; sometimes the barcode will have the ISBN number right above it. 3. Once you've entered the ISBN hit "Enter" and you'll see the details of the book in Zotero. Once again, the information includes: Item type, title, author(s), publisher name and place, year of publication, ISBN and call number, plus more. And now you've successfully added a book into Zotero by its ISBN! You can do this same action for other standard identifiers (DOIs or PMIDs). Zotero will (usually) automatically sense what type of resource you're looking at in your browser. Checking out a painting on the Louvre's website? Zotero will know how to capture that. Listening to a musical audio-recording? Zotero can capture that too. Watching a streaming video from the library website? Zotero can definitely capture that. In all these cases, you'll notice the "capture" icon in the top-right usually changes to whatever medium you are looking at; if you're watching streaming video from the library, the icon will become a video camera. If you click it, Zotero will do its best to save all the important information. You must still double-check that it collected the correct information! Computers still make mistakes. If it did not collect all the necessary information, input that info into Zotero immediately, so you can export complete citations in the future. Here's an example of what Zotero looks like once different item types have been saved. Notice how the icon changes to show the differences between an audio recording, a video, a painting, and a dictionary entry. This means the information captured will vary according to the item type; for instance, a definition might have less bibliographic information than a journal article. If you are browsing the search results within the library catalog, or within a journal or database, Zotero will allow you to save time by selecting multiple items in one click. You'll notice the icon in the taskbar changes to a folder. If you click that folder, a pop-up will appear that lets you select many results and save them all at once. Note: Sometimes saving multiple items in this way can result in missing information (no DOI; missing punctuation). Always double-check your citations when using a reference manager like Zotero. 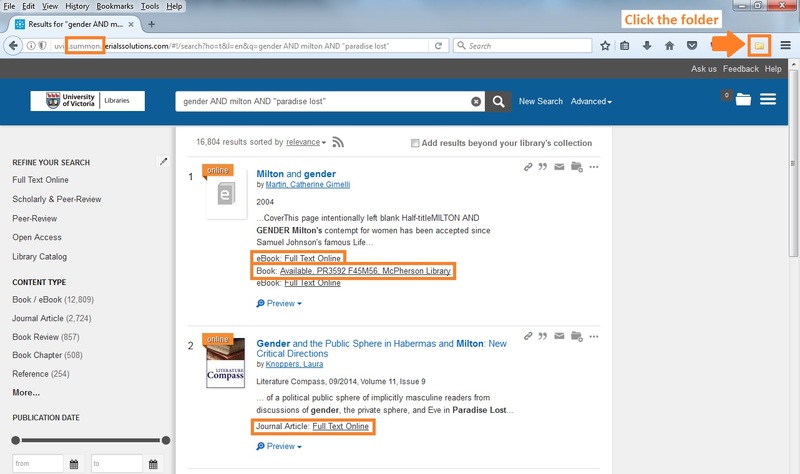 Check out the pictures below to see what different search results look like with Zotero. This is what the results of a Summon search would look like. The resources are all different (e-book, book, journal article, etc.) but all are able to be selected via the folder button to be saved to Zotero. A search in the catalog will pull up books and journals from the collection. If you want to save multiple books at a time, the proces is the same; simply click the folder, then select which books you want to save. You can also save items from one specific database. Below are the search results from Academic Search Premiere. Once again, clicking the folder will generate a list of the resources that can be saved to Zotero. 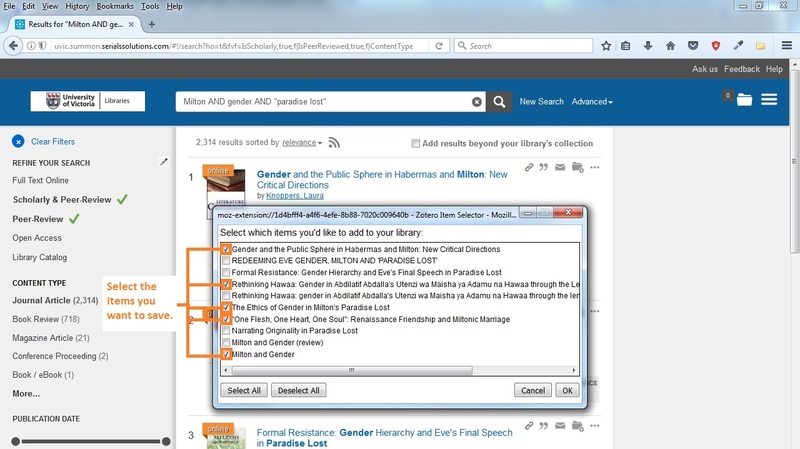 Zotero has further tools to help you organize and add to the items in your library. For instance, if you have a book or journal article saved to your Zotero library, and you would like to leave yourself or your colleague a note regarding this resource, you can create a note and attach it to an item, or create a standalone note. You can also attach tags to items, to indicate similarities or commonalities. Finally, you can attach PDF's to items in your library, so they are easily accessible and located conveniently in a single place. 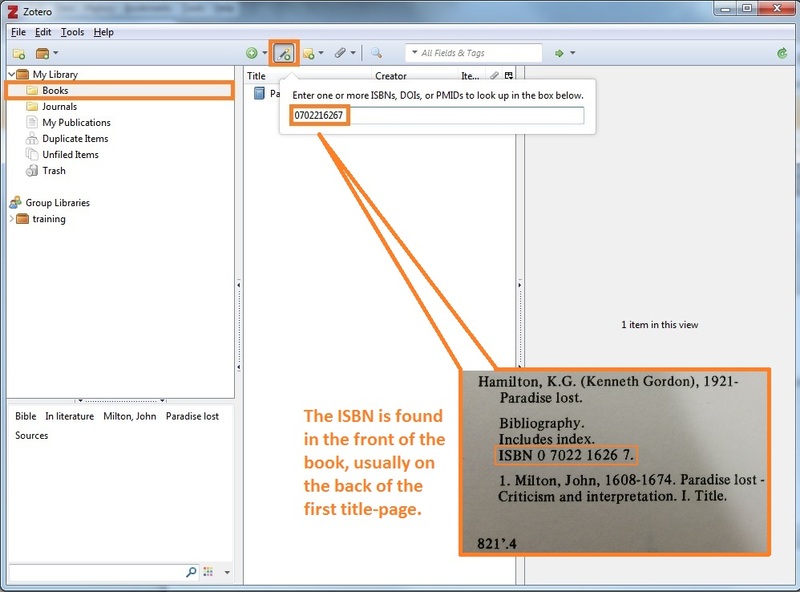 In this section, we will look at how to add notes, tags, and PDFs. There are two types of notes and two ways to add notes in your Zotero library. The first note type is a child note; this note is attached to an item in your library. The second note type is a Standalone Note; this note lives in your library and is not attached to an item. 1. To add a child note, make sure you have selected the item you want to attach the note to. Click the "New Note" button, in the top toolbar. In the drop-down, you will be able to select "Add Child Note". This is the method by which you would add a Standalone Note to your library as well. Select the item in your library, go to the right pane, and click the "Notes" tab; click the button that says "Add" to create a note for that item. 3. Once you have clicked "Add Note", a blank window will appear with the tools you need to format your note. 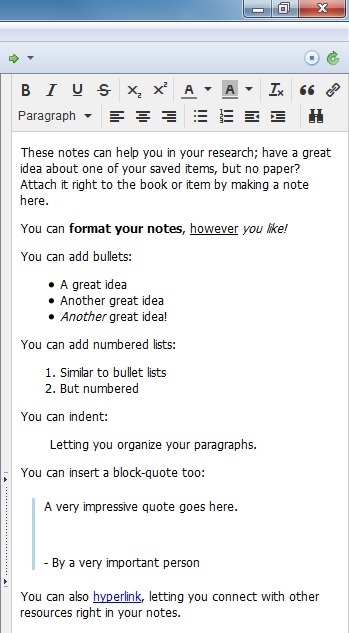 See the picture below for an example of how you can format your notes. Congratulations! You have successfully added a note to your Zotero library. Tags are easily added through the "Tags" tab in the top of the right window, or at the bottom of the "Notes" tab. Tags must be attached to an item in your library; there is no standalone tag like there is a standalone note. Once you have added one tag, simply click "Add" to create more for the item. In the bottom left corner of the Zotero window there is a small area where you can view all the tags within your library, and even look individual tags up. Some items you save from the internet come with their own tags, which you can either keep or delete. Zotero can also hold PDFs of the items you have saved using the Connector. 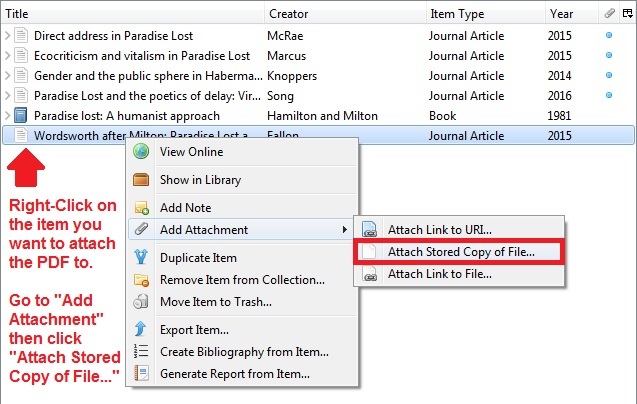 Often, the PDF of a journal article will automatically be attached to the item in your Zotero library, but if it is missing you can add it yourself, or you can add a PDF that you think is related. 1. Right-click on the item in your library that you would like to add the PDF to. Go to "Add Attachment" and then select "Attach Stored Copy of File". 2. Find the saved article you wish to attach to the Zotero item. Select it, and hit "Open". 3. 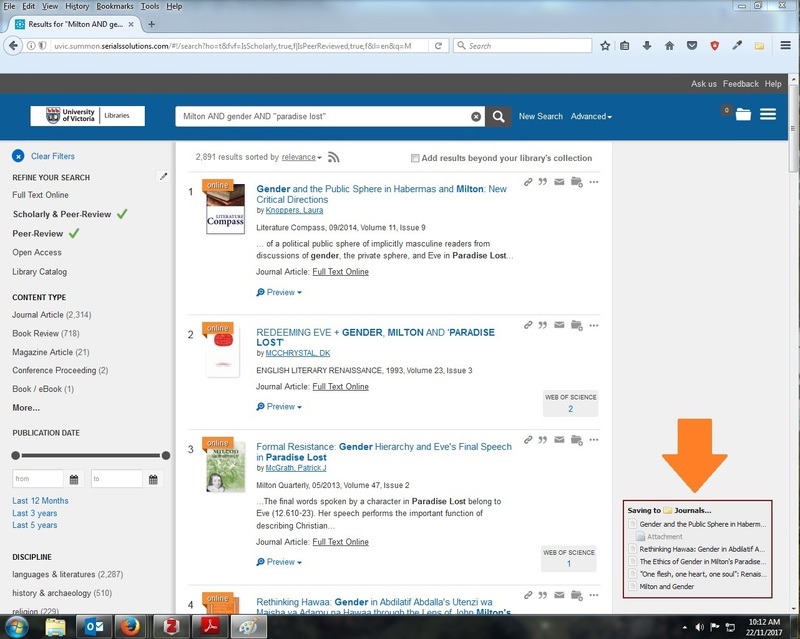 Now you will see that the PDF has been attached to the item in your Zotero Library!